This RUST base design video is brought to you today by our partner xRaw. This RUST base design titled “The Brick” is a bunker-style base design suitable for solo, duo, trio and groups. 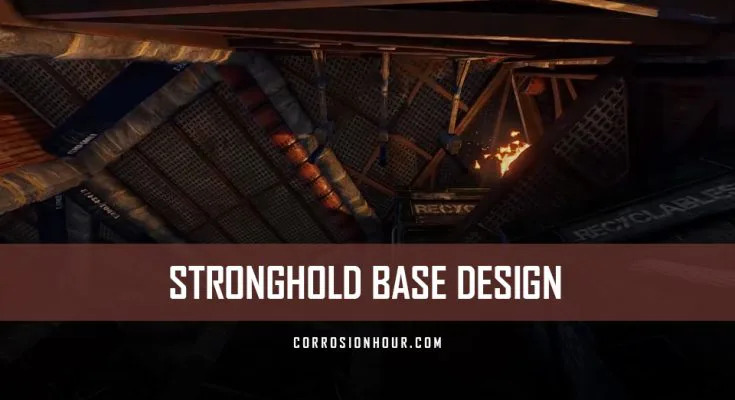 The stronghold bunker base is a starter-to-main design, which means that each expanded stage is a fully-functioning and strong base. Groups can live in the interior starter base while expanding to the next stage as resources become available. The Brick stronghold bunker base features a bunker entrance, un-lootable TC and ample opportunities for loot spreading throughout the base. This design will cost raiders 90+ satchels to get straight to the TC and 160+ satchels to get all of the loot. And now, checkout this Stronghold Bunker Base design. Cheers! Hey guys and welcome back to another video. In today’s video we’re looking at rust base design called the brick–a starter to the main base for solos, duos, and trios upwards which takes into account features such as, loot spreading, an unlootable TC, and a bunker entrance. Coming into the base here we have a metal door followed by 2 garage doors to open the area up, you can swap these out for two sheet double doors to create a ‘door block airlock’. Once inside, we have the metal shopfront here so you can see outside. Heading further into the base here we have the bunker entrance, simply destroy the twig half wall and the metal floor will disappear and you can get inside. Whilst this bunker method is weak to fire, the main purpose of this is the undrainable shotgun traps on the other side, completely stopping raiders from progressing without going through a wall OR draining the turrets. Coming into the center of the base here, we have your first loot room on the right, containing 5 large boxes and 1 furnace, followed by an additional 3 furnaces in the triangle where – you can swap these 3 furnaces out for an additional 2 large boxes and 2 small boxes if you need the extra space! And through this door here, we have the same layout again, this can be swapped for what suits best. Continuing to the other side of the base here, we have your third loot room through this door here containing another 5 large boxes, 2 furnaces and your barbecue. And finally, through this door here we have another 4 furnaces, your research bench, another large box and your un-lootable tool cupboard, almost completely hidden from raiders. To seal up the bunker, simply place a twig half wall followed by a floor on top, upgrade to the sheet and it’s sealed. The footprint of the base is simple, starting with a square and triangle before expanding outwards to add a loot room, and again for 2 loot rooms and the bunker entrance before finally adding honeycomb. To break down the raid cost, this is the cost to raid directly to the TC. And then this is the cost for all the loot. This base is going to cost you 8.1k metal, 6.1k wood, and 24.2k stone with upkeep of 2.4k metal, 10 wood and 4.3k stone, a more detailed costing can be found in the comments. I do a number of base building guides on my channel so feel free to check these out, as always if you did enjoy the video be sure to leave a like and don’t forget to subscribe with notifications turned on, to catch all of my content.